Prep the lobster by dispatching them and cutting them into bite sized pieces. Next, put the lobster pieces in a large bowl. Mix the flour and cornstarch together in a bowl and sprinkle it over the lobster. Toss until all the lobster is lightly coated. Add the sticky rice (after soaking and draining) to a pot of 8 cups of boiling water and cook for 5 minutes, stirring occasionally. Strain into a colander and give it quick rinse with cool water, and set aside to drain. Use a fork to break the rice up a bit before you add it to the wok to make the stir frying easier. Heat 2 cups of oil in your wok over medium high heat. When little bubbles form around a bamboo or wooden chopstick dipped in the oil, it’s hot enough! Beat the egg yolks, and drizzle them into the oil to fry. They’ll cook quickly, be ready to immediately pick out the egg using a fine meshed strainer, and set aside. Using the fine-mesh strainer, make sure there are no egg debris in your frying oil. Turn the heat down to low and fry the garlic at a low temperature (200F), until it’s light golden brown in color. Transfer to a dish using your fine-meshed strainer and set aside. Now crank up the heat to medium high. When the oil reaches about 375 to 380 degrees F or until *just* smoking, fry the lobster in batches for 30 to 60 seconds for each batch, gently moving the lobster around with your metal wok spatula or until the shells just turn pink. Make sure the lobster is cooked, but not overcooked, or it will be rubbery! You must also let the oil come back up to temperature after each batch since the cold lobster cools down the hot oil significantly. Drain the lobster pieces of excess oil using a spider or steel strainer and set aside in a large bowl. You can also move them to a wire rack to drain further. 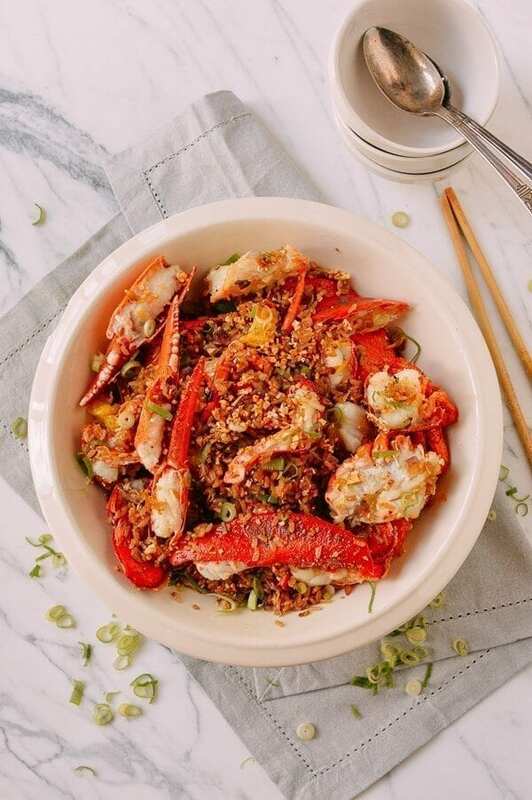 You will have leftover oil from frying the lobster, egg yolk and garlic. Pour the oil through a fine mesh strainer into a heatproof bowl. We’ll use some of this for the fried rice, but for the rest, let it cool, refrigerate it, and use it for cooking other recipes! The infused flavors will add good umami to other dishes, and it’s what many restaurants do! Now it’s time to bring all these elements together. If your wok is on the smaller side, you may want to cook the sticky rice in two batches! Add 1 tablespoon of the frying oil to the wok set over medium-low heat, and add the chopped ginger. Gently caramelize the ginger, taking extra care not to burn it. Next, add the Jinhua ham, and let it fry for 30 seconds. You can use dry-cured Virginia ham as a substitute for the Jinhua ham, which is much harder to find! Next, add the chopped red onion, and stir fry for 30 seconds, or until fragrant and just softened. Add the par-boiled sticky rice and stir-fry for 2 minutes or until reheated. Beat the egg whites with a fork until frothy and pour on top of the rice. Continue stir-frying for another 1 to 2 minutes, or until the rice is coated in the egg white. Next, add the lobster and any juices from the bowl, and gently fold the lobster into the rice using your wok spatula until well combined. Then add half of the fried garlic and the green parts of the scallions. Give everything another quick toss, scoop it all up into a serving platter and sprinkle the rest of the fried garlic over the top!